Located between Calvi and Ile Rousse, Algajola is famous for its fortress and castle built waterfront. Its fishing port is full of charm, as the village and its picturesque streets. At the seaside you can find beautiful sandy beaches where you can enjoy magnificent sunsets. 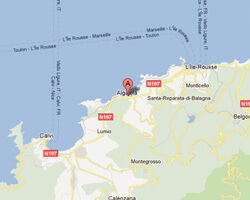 In Algajola enjoy a seaview holiday rental. 2 rooms apartment 40 m2. Terrace with outdoor furniture and barbecue. Nice view of the sea and the bay. 1 Bedroom(s), 1 double bed(s). short stays possibility. Final cleaning : 300 €. Between Calvi and Ile Rousse, between sea and mountain, in a property of 5000 m2 overlooking the bay and the village of Algajola, our villa enjoys a breathtaking view of the sea. 290m2 house with a 130m2 terrace. Private pool with sea view. 4 Bedroom(s), 2 double bed(s). Final cleaning : 200 €. 2 Bedroom(s), 1 double bed(s). 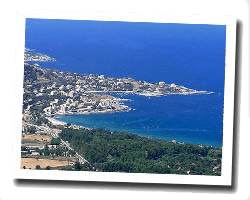 Located just a 5-minute walk from white-sand beaches, L'Ecrin is located in Algajola just 15 minutes away from L'Île-Rousse. 2 Bedroom(s), short stays possibility. with an outdoor pool and panoramic views of the sea and a terrace, Residence San Damiano is located in Algajola. 2 Bedroom(s), 2 double bed(s). short stays possibility.